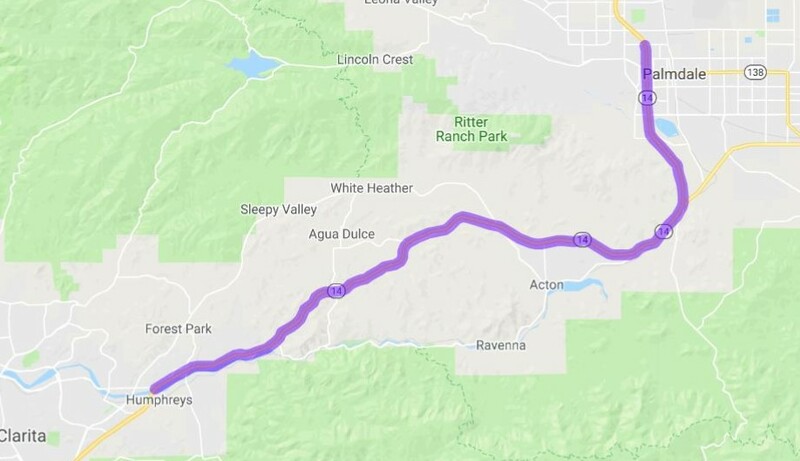 PALMDALE – Beginning Monday, March 18, Caltrans will close portions of the Antelope Valley (14) Freeway in the Palmdale and Santa Clarita areas for a pavement rehabilitation project, the agency announced. The closures are scheduled nightly through Saturday, March 23, from 7 p.m. to 6 a.m., but the closures may start and end later, according to a news release from Caltrans. “The project requires closing two lanes to facilitate a safe work zone to protect workers and motorists,” the news release states. The $6.6 million project involves replacing concrete slabs, grinding and striping both directions of SR-14 between the Santa Clara River and Technology Drive. The project aims to improve the condition of the lanes and create a smoother ride for motorists, according to Caltrans. It is slated from completion this spring. “Motorists should expect delays and are strongly advised to plan ahead, use alternate routes and avoid the area,” the news release states. All closures are also weather-permitting and subject to change. Motorists can check traffic conditions before they leave by visiting the Caltrans Quickmap at http://quickmap.dot.ca.gov/. 11 comments for "14 Fwy lane closures starting March 18"
I lived in Hawaii on Oahu. They have a system of K-rails(center divider) like ours but they aren’t as long. And there is a huge tractor with wide wheel base that drives over the k-rail(straddles) and as it slowly drives over the k-rail it kicks the rail over a few feet. So I’m the morning the barrier is moved a lane or two into the non traffic side of the frwy. And around 2p the tractors drive back and kick the barriers the other way two lanes. Genius! Could you imagine having an extra 2 lanes on the traffic side of the frwy without years of construction!! Open up the carpool lane for everyone on the 14….no one carpools. Except during commuter hours it is open to all. We are lucky in that respect since so many car pools lanes are full restriction all of the time. I love the fact that all the “work” they did a few months ago to the northbound lanes actually did nothing to help the freeway and actually made the road conditions worse. tons of divots in the road where they took up the paint in the carpool lanes. I ride a motorcycle and those divots are a road hazzard now. Add an additional lane while you are at it, thanks. Our leadership is asleep at the wheel and if they drove this road everyday like we do it would have a additional lane under construction. Alas there is no such improvement approved. Tom Lackey and Scott Wilk are complete failures. Jim Gilley…It starts with the Governor, and works its way down, (CALTRANS). It starts with the Governor? Caltrans? What are our local reps here for? All we hear is crickets from these partisan representatives. Jim Gilley…Are you the same Mr. Gilley in Dec. 7, 1994 article? If so, why are you complaining?